Maurice Greene was born in Kansas City, Kansas and attended F.L. Schlagle High School. In his youth and high school, he participated in both American football and track and field. After high school, Greene received a Track scholarship to the University of Kansas. In 1995 he took part in his first major international tournament at the World Championships in Gothenburg, but was eliminated in the 100 m quarter-finals. His next season was disappointing, as he failed to make the American team for the 1996 Summer Olympics in Atlanta. 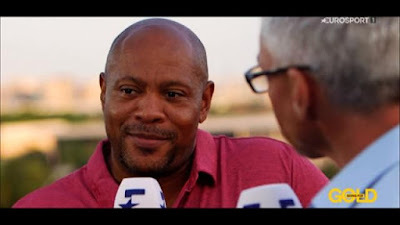 After watching the Olympic final from the stands, Greene made his way to Los Angeles to seek the coaching of John Smith. He joined the start up HSI group. He went on to become the group's most visible member. The following season would be his breakthrough. At the World Championships in Athens, Greene won the 100 m title. 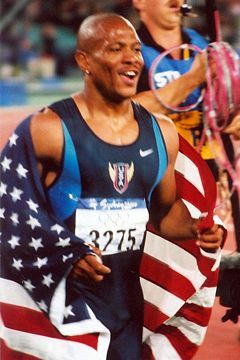 This marked the beginning of Greene's dominance in the 100 m. He successfully defended his title in 1999 and 2001 and captured the Olympic gold medal in the 2000 Olympics. He was also successful at the 200 m. At the 1999 World Championships, he also won the 200 m title, the first to win both sprint events at a World Championships. 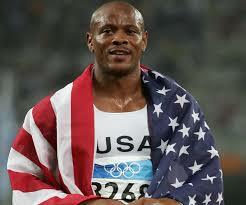 However, he did not run the 200 m at the 2000 Olympics after an injury at the US trials. In 1999 he set the 100 m world record at 9.79 s (+0.1 m/s wind), beating Donovan Bailey's standing world record of 9.84 s (+0.7 m/s wind), and lowering the world record by the largest margin since the advent of electronic timing. 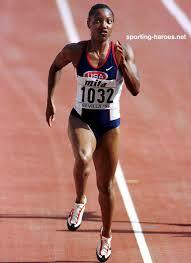 Greene also matched Bailey's 50 m indoor world record time, but the run was never ratified. He also set the 60 m indoor world record twice. His 60 m indoor record is currently at 6.39 s. Both records still stand. World Records at the same time. 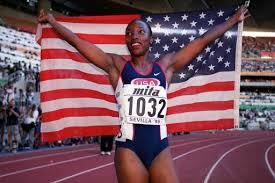 Inger Miller (born June 12, 1972 in Los Angeles, California) is a track and field sprint athlete, competing internationally for United States. She is the daughter of Lennox Miller, an Olympic champion runner from Jamaica. Miller was a Tournament of Roses Princess in the 1990 Court. During her professional career she was a member of HSI. She originally won the bronze medal in the 60 meters at the 1999 IAAF World Indoor Championships, but she tested positive for excessive caffeine after the race. Her results from the tournament were nullified and she received a public warning. She was 1999 World 200 m champion; 1999 World Champs 100 m silver medalist; 1996 Olympic 4 × 100 m relay gold medalist; 4 × 100 m relay gold medalist at 1997 World Champs; 2003 World Outdoor 4 × 100 m silver medalist. Together with Jill Hawkins, Miller started Miller-Hawkins Productions, a full-service event coordinating company. The company currently operates out of offices in Atlanta. FOR OLYMPICS IN 200 METERS!! 'FLY HIGH' FOR AMERICAN WIN!! 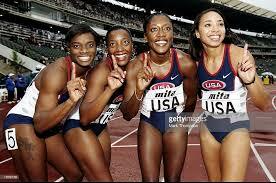 Chryste Gaines, Marion Jones, Inger Miller and Gail Devers set the American Record (41.47) in the 4x100m relay while winning the 1997 World Championship. 2003 SILVER MEDAL WIN IN 4X100 RELAY!! Our coverage of the Atlanta 1996 Olympic Games continues as we focus on the intriguing stories of the athlete Inger Miller and her quest for an Olympic medal as well as the love story that shaped the career of gymnast Donghua Li.